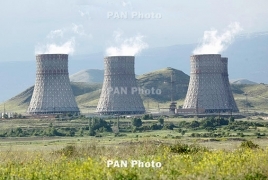 PanARMENIAN.Net - Rosatom has delivered a turbo-generator to the Armenian nuclear power plant, the company said Monday, February 4. This is the second turbine generator supplied to the NPP in the town of Metsamor as part of the project to extend the service life of the plant. The new generation equipment will improve the plant’s efficiency and increase power generation. The project will be completed by the end of 2021, and Armenia will get a nuclear plant with modern equipment and safety on a par with world standards.